We’ve been excited to partner with Microsoft, including enabling innovative customers like Beco to build an IoT cloud on Microsoft Azure. Working with the Azure Kubernetes Service (AKS) team and Brendan Burns, distinguished engineer at Microsoft, we’re excited to showcase how Portworx runs on AKS to provide seamless support for any Kubernetes customer. Brendan and Eric Han, our VP of Product, were both part of the original Kubernetes team at Google and it is exciting to watch Kubernetes mature and extend into the enterprise. 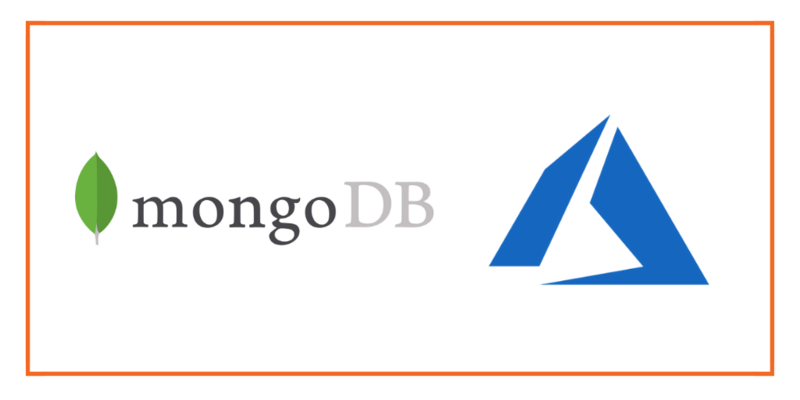 Today’s post will look at how to run a HA MongoDB database on Azure Kubernetes Service (AKS), a managed Kubernetes offering from Microsoft, which makes it easy to create, configure, and manage a cluster of virtual machines that are preconfigured to run containerized applications. Portworx, is a cloud-native storage platform to run persistent workloads deployed on a variety of orchestration engines including Kubernetes. With Portworx, customers can manage the database of their choice on any infrastructure using any container scheduler. It provides a single data management layer for all stateful services, no matter where they run. 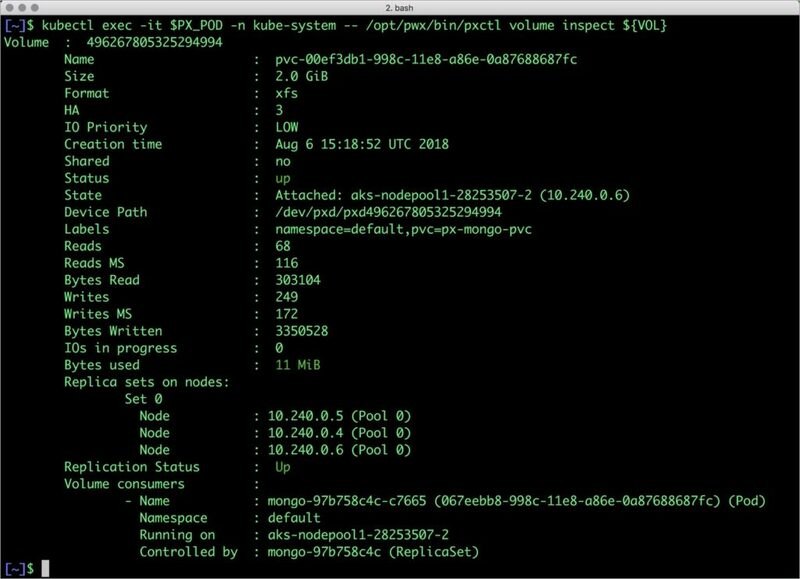 This tutorial is a walk-through of the steps involved in deploying and managing a highly available MongoDB NoSQL database on AKS. Portworx is fully supported on Azure Kubernetes Service. Run the following commands to configure a 3 node cluster in Europe West. More on Azure AKS is available here. Running storage nodes separately from compute nodes will allow us to independently scale compute and storage resources. We use Portworx to manage the storage nodes and also access storage from the compute nodes. Follow these steps to create three storage node VMs. Afterwards, we attach the Managed Disk to the storage nodes in the Azure portal using these instructions. Finally, we ssh into the VM and install Portworx on each of the storage nodes using the commands below. For the CLUSTER-NAME, use the same string in each of your installs for that cluster. Installing Portworx on Azure Kubernetes Service is not very different from installing it on a Kubernetes cluster setup through Kops. Portworx AKS documentation has the steps involved in running the Portworx cluster in a Kubernetes environment deployed in Azure. Portworx cluster needs to be up and running on AKS before proceeding to the next step. 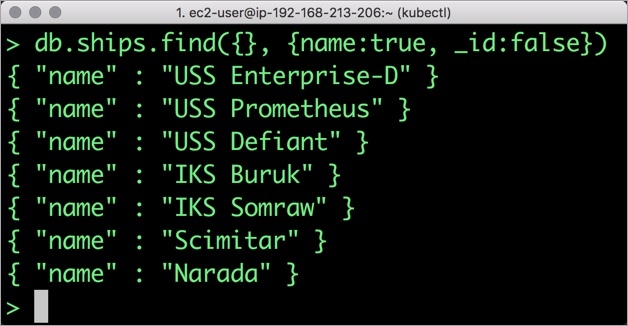 The kube-system namespace should have the Portworx pods in running state. Once the AKS cluster is up and running, and Portworx is installed and configured, we will deploy a highly available MongoDB database. After testing end-to-end failover of the database, let’s perform StorageOps on MongoDB our AKS cluster. Check the new volume size. It is expanded to 2GiB. Notice that the collection is still there with the data intact. We can also push the snapshot to Azure Storage if we want to create a Disaster Recovery backup in another Amazon region. Portworx snapshots also work with any S3 compatible object storage, so the backup can go to a different cloud or even an on-premises data center. Portworx can easily be deployed on AKS to run stateful workloads in production. Through the integration of STORK, DevOps and StorageOps teams can seamlessly run highly-available database clusters in AKS. They can perform traditional operations such as volume expansion, snapshots, backup and recovery for the cloud-native applications.